Retail $73.00 SAVE 27% ! "Excellent Airbrush for people just getting into airbrushing"
Can be used in 3 sizes - #1 (pashn-1)(Spray Pattern 1/32"- 1" Light Fluids), #3 (pashn-3)(Spray Pattern 1/32"- 1 1/4" Medium Fluids) and #5 (pashn-5)(Spray Pattern 1/16"- 1 1/2" Heavy Fluids), with the purchase of different size Aircap and Color Adjusting Part. Suitable for both left and right-handed users. Optional color cups and bottle assemblies (see comments). 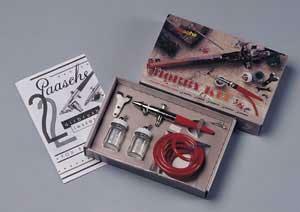 excellent airbrush at a great price! easy to use and easy to clean . if you are new to airbrushing start here .